In this post some recurring patterns that may affect the duration of stay of nurses working in a facility are enumerated. These observations are derived from our interactions and involvement with different healthcare facilities mostly in the Tri-State area. 1. Psychological. Nurses, at the time of hire, may not be psychologically equipped to deal with pressures coming from work. Upon hire, recruits usually show the best of themselves and recruiters are given very little clue as to how one would fare at work. ♦What we do to counter this concern is to perform a multilayered assessment process that doesn’t just focus on credentialing, but also pays attention to attitude and personality clues of our candidates. ♦We work closely with the HR of a facility in pre-qualifying candidates. We usually send the facility representative several pre-qualified candidates to select whom she thinks will work out best for the facility. ♦Another tool we use is an Evaluation Form that functions as ‘check and balance‘ for the healthcare facility and agency. For the nurse, a regular evaluation reaffirms his work, leading to greater confidence in himself and his work that ultimately benefits everyone in the equation. 2. Personality and Culture. A big question is matching: Is the nurse, personality-wise, matched to the culture of the new workplace? In culturally diverse workplaces such as New York City where customs and traditions are fanned alive by immigrants, the ‘standard’ becomes confusing. Add to that the variety of patients’ cases, situations and other factors that come into play further blurring the lines between the acceptable and what is not. ♦We have a culturally sensitive recruitment procedure that looks deeper into a candidate profile. Insights drawn from our deliberations are then used to match our retinue of nurses to facility needs and requirements. 3. Education. A lot of local schools did not prepare the nurses for real-life work situations. Nurses, especially the new ones, have these preconceived ideas of what the ideal work setup should be as shown in media (i. e ER, Grey’s Anatomy, Nurse Jackie), which they unwittingly bring to the workplace. Comparison of their ideal versus the reality results to confusion, disappointment and in some case, extreme disgruntlement. ♦What we do to counter this issue is to let the nurses undergo our uniquely designed orientation that is most often customized according to facility requirements. This orientation covers the basics such as scheduling, policies, facility idiosyncrasies, documentation and many more. 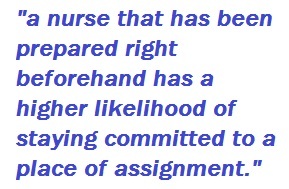 The objective is to let the nurses be given an overview of the setup of the facility of assignment. As early as possible, we proactively address all predictable issues and manage the expectation of nurses in these sessions. 4. Work Environment. Several environmental dynamics come into play as well. Factors such as union policies, lackluster attitude of ‘regular workers’ towards ‘agency workers’, minor politics, cultural insensitivity of some parties, difficulty adapting to technology required in modern patient care tasks, gaping difference in rates and benefits between regulars and agency workers, and many other factors are likely to affect the employment duration of a nurse. One glaring example is in one huge geriatric care facility where we placed nurses that were given 2-day orientation as opposed to the 2-week to a month-long orientation of directly hired nurses. The agency nurses had some apprehensions about continuing work at the at the facility because of lack of orientation. They further reasoned that they were frequently on ‘float status’, thus requiring more orientation days in order to avoid any unwanted incident that may cost them their license. ♦The best answer here is preparation. As mentioned earlier, a nurse that has been prepared right beforehand has a higher likelihood of staying committed to a place of assignment. 5. Options. Once issues are not resolved timely, any worker would seek other opportunities. Fortunately for nurses, they have numerous options at bay that may look like the cure-all to their employment ails. So once dissatisfied, they would rather leave than take the excruciating process of correction. The handling agency should have foresight and proactive ability in managing the issues in a timely manner. Our office is always open to suggestions on how we can further improve our services. We customize our services according to a healthcare facility’s current setup, preferences, and situation. We are available for consultation. Email me at mprimero@meridiannurse.com for an appointment.